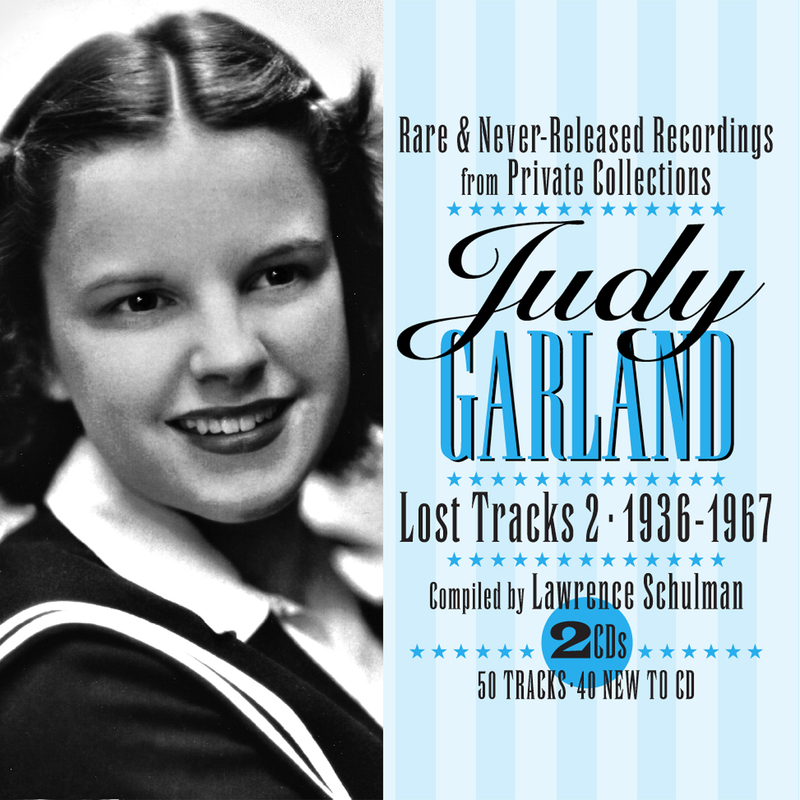 Hailed by The Wall Street Journal, JSP Records’ historic, best-selling 2010 release of the 4CD Judy Garland: Lost Tracks 1929-1959 contained countless previously unreleased tracks from private collections around the world. Lost Tracks 2 1936-1967 picks up where the earlier volume left off by containing numerous tracks that have been discovered since 2010. The Judy Garland (1922-1969) renaissance continues under the guidance of Lawrence Schulman, who has been the wind behind all of JSP’s acclaimed sets devoted to the legendary singer. With audio restorations by the famed engineer, John H. Haley, and sleeve notes by the renowned Garland historian, Scott Brogan, who could ask for anything more. The year 2019 marks the 50th anniversary of the death of Judy Garland. She passed away on June 22, 1969, at the young age of 47. In her relatively short life, Garland amassed a unique and immense body of work on stage, in film, on the radio, on television, and on studio recordings. That body of work is so vast that previously unknown and unreleased recordings are still being discovered even now, as the 40 new-to-CD tracks in this set demonstrate. If we were to put every existing Judy Garland recording together in chronological order, it would seem that Garland was singing every waking moment. It makes one wonder, how did she even make it to 47? When the first Lost Tracks set, conceived by Lawrence Schulman, was released in 2010 it was groundbreaking. Not only did it present previously unreleased tracks to the public, it also presented the long-lost 1935 Decca test records that are the very first studio recordings made by Judy Garland, then only 13 years old. All of the recordings were restored and remastered for the first time. This new set continues that tradition. Since the 2010 release, we’ve seen the discovery of many unknown and unreleased Garland recordings. Also in the interim, there have been major advances in the field of audio restoration and remastering. The software available today gives us a chance to hear these recordings in a clarity unattainable even five years ago, let alone nine years ago. The tracks on Lost Tracks 2 benefit from these technological advances and audio engineer John H. Haley's brilliant work. There is much to celebrate. Chief among the treasures are rare early radio performances by the young Garland courtesy of the John Newton collection. Garland's early radio recordings are usually underrepresented in CD compilations but here we’re treated to nine new-to-CD performances. After she signed with MGM in September 1935, Garland was a major presence on the radio. The studio had her on the air long before putting her in films as a way of introducing her mature voice to audiences whom they assumed wouldn't believe a voice like hers was coming from someone so young. Under the tutelage of her lifelong mentor Roger Edens, Garland showcased her talents in a variety of styles. The less formal atmosphere of radio shows allowed her to experiment. What is revelatory is that we can hear the infectious youthful enthusiasm of a great artist enjoying the discovery of what her voice was capable of. Garland’s April 20, 1937, performance of “Johnny One Note” might be the first nationwide public radio performance of the new, soon to be standard, by Rodgers and Hart. The song premiered on Broadway on April 14, 1937, in Babes In Arms which was just six days prior to this Garland broadcast. Cut from (and never recorded for) the 1939 film version of the show starring Garland and Mickey Rooney, she later performed the song as her encore in 1948’s Words and Music. For decades fans wondered what the “Young Judy” version would sound like. Now we know: fantastic! Highlights of the movie outtake recordings featured here are “Sun Showers” which was deleted from 1937’s Thoroughbreds Don't Cry and “Swing Low, Sweet Chariot” from 1938’s Everybody Sing. The latter is a partial outtake, having been trimmed in the final release of the film. “Sun Showers” is the perfect showcase for Garland's voice. It’s a puzzle why such a great performance was cut. Alternate takes of well-known Garland standards are also included in this set. “(Dear Mr. Gable) You Made Me Love You” was Garland’s first “identifier song,” which she performed in 1937’s Broadway Melody of 1938. “I’m Nobody’s Baby” from 1940’s Andy Hardy Meets Debutante is another vocal showcase. No one ever sang the song better. Disc One concludes with Garland’s 1943 radio rendition of “The Joint Is Really Jumpin’ Down At Carnegie Hall” which she debuted in the 1943 film Thousands Cheer. The performance is an example of Garland's budding mature voice. Or as some call it, “her 1940s voice.” Garland was definitely coming into her own. The recordings in this set are not limited to Garland’s early radio and film performances. While at MGM Garland made studio recordings for Decca Records and we have two here, rare alternate takes of “Mine” (1944) and “Yah-Ta-Ta, Yah-Ta-Ta (Talk, Talk, Talk)” (1945). Both are perfect examples of the maturation of Garland's voice in the mid-to-late 1940s and her wonderfully infectious rapport with Bing Crosby. The number of surviving Garland recordings from the early 1950s is much less than this from the rest of her career. In spite of that, this set is able to provide some wonderful examples from that era, including the little heard, but still charming, “Wishing (Will Make It So)” from the 1951 CBS-Radio adaptation of Cinderella for the Hallmark Playhouse series. Garland’s recordings for the U.S. Treasury Department in 1952 are examples of her new, more mature voice. The soundtrack album to Garland's film masterpiece A Star Is Born (1954) has never been out of print. Included on that album is her now-famous tour de force “Someone At Last.” In fact, the working title of the number was “tour de force.” The version on this set is the CD debut of the rare alternate take without the dialog, effects, and studio chorus plus a great ending not heard in the final film or the soundtrack album. Talk about a unique listening experience. Garland’s vocals are front and center, and her full throttle ending is hair-raising. No one knows why it was deleted. It’s hard to believe, but Garland’s famous 1955 television rendition of “Over the Rainbow” from the Ford Star Jubilee special has never been remastered for CD. This version is the one that many consider the definitive adult Garland version of the song that will forever be hers. Garland returned to television in 1956 for CBS-TV’s General Electric Theatre. “Come Rain Or Come Shine” is a standout. The song was fairly new to her repertoire and it became another Garland standard. Garland’s recordings for Capitol Records are some of her finest, so any new discovery from those sessions is a rare treat. Garland's talent was so great that even her alternates are worth releasing. Presented here for the first time, from the collection of Raphael Geroni, is an alternate take of “Down With Love” recorded in 1960 for the classic That’s Entertainment! album. For many fans, this is the greatest of all her Capitol albums and with good reason. It’s as perfect as anyone can get on an LP of standards. It also brings to mind the fact that it must have been tough to decide which takes of songs ended up on the final releases of albums. At this time in her career, Judy alternated between the concert stage, television, and a few films. More new-to-CD performances from this era are presented, finally remastered after years of floating around the collector's circles. A standout (aren’t they all? ), is the previously unreleased rehearsal recording of “What Now My Love?” for Garland’s concert with daughter Liza Minnelli at the London Palladium in 1964. Garland was suffering from vocal issues but that didn’t stop her from giving a great performance, even in rehearsal. For comparison, this is followed by her triumphant rendition of the same song in 1966 on NBC-TV's Kraft Music Hall with full orchestral accompaniment. Garland delivered more than anyone else could have when she recorded the final track on this set. “I’ll Plant My Own Tree” was written for Garland to sing as “Helen Lawson” in the film version of Valley Of The Dolls (1967). The song is meant to show off the superstar quality of the character. Sadly, it’s not a good song. Out of context, it could be mistaken for parody. Garland didn’t want to record it, preferring “Get Off Looking Good.” But ever the trouper she recorded it and against the odds she makes it sound better than it is. Only a talent of her caliber could have pulled that off. Garland never completed the film and the song was re-recorded by Margaret Whiting for Susan Hayward (the new “Helen Lawson”) to lip-synch to. A mono version with very bad audio appeared on LP in the late 1970s and this stereo version has been traded by collectors for several decades. Here it’s finally remastered. It’s a fitting end to this set of rare treasures that present the enormous scope of Judy Garland’s talents, achievements, and her progression from enthusiastic youngster to a living legend. From beginning to end, Judy Garland was able to deliver a performance like no other performer before or since. And we’re the lucky recipients of her talents that continue to electrify us fifty years after her death.